How to get there This is the only road connecting Italy and Austria between the road from Toblach to Lienz and the Plöckenpass. From Obertilliach (1342m (lowest point)) near the Kartitscher Sattel in Lesachtal a road goes straight down the valley and crosses a little river. From there it is a decent gravel road (if dry) up to a little lake. There is a road choice before this and (if I remember correctly) one should take the right hand road up serpentines to the lake and then up serpentines to the left until you reach the Neue Porzehütte. From there a new road has been built in 2003 to the top and it is cyclable if you are determined to do it (loose gravel). At a gate just before the pass (just below what you can see in the photo) the road turns more into a wide foot path that is very steep and I doubt it could be used by four wheel vehicles (it could perhaps by cycled with an MTB). The Italians have NOT built a new road, but the old road is there and seems like it was much better done originally. The problem is finding it! You have to go to the right at the top (I did not as I thought it was the least likely direction to go). This gravel road is unfortunately too rough even for most people on mountainbikes, and it is rather sad it had not been restored as it was obviously fine once. You will have to walk at least down to the first junction (3 km or so). Here the road is partly rideable and soon asphalted down to Ost. alle Alpi/Segheria (1004m) on the road to Cima Sappada. N:R1, R1-2, S-R2; S:R1, R2. 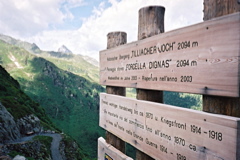 Other comments I learned about the new road in an e-mail from the owner of the Neue Porzehütte in 2003. With improvements on the Italian side this could become a realistic road choice even for road bike cyclists. I have never seen such a variety of Alp flowers at a pass before. This combined with wonderful views of Dolomites mountains and the Austrian Alps at the top makes this a very beautiful pass.